The concept of libraries as makerspaces first hit my radar last November when I read about the Fayetteville Free Library’s FabLab. As I began hearing more buzz about libraries and makerspaces the first few months of this year, I decided that learning more about this concept and exploring how I might apply the elements of makerspaces to my library program would be a personal learning project for the summer. Modeled after hackerspaces, a makerspace is a place where young people have an opportunity to explore their own interests, learn to use tools and materials, and develop creative projects. It could be embedded inside an existing organization or standalone on its own. It could be a simple room in a building or an outbuilding that’s closer to a shed. The key is that it can adapt to a wide variety of uses and can be shaped by educational purposes as well as the students’ creative goals. Makerspaces are collaborative learning environments where people come together to share materials and learn new skills… makerspaces are not necessarily born out of a specific set of materials or spaces, but rather a mindset of community partnership, collaboration, and creation. In late spring, I was even more intrigued by the concept as my friend and colleague Kristin Fontichiaro began sharing some of her thoughts on makerspaces and the possibilities for school libraries. While immersing myself into researching makerspaces last week, I discovered friend and fellow librarian Heather Braum is also fascinated by the possibilities, and she shared her current list of resources with me including photos and video from her visit this past weekend to the Kansas City Maker Faire. You can learn more about Heather’s MakerFaire experience in her new blog post here. I believe that makerspaces can provide students AND teachers opportunities to exercise these elements of participatory learning and to form what James Gee calls affinity spaces, communities formed around passions and shared interests. Tinkering, collaborative learning, play, conversations for learning, intergenerational learning,experimentation, inquiry, the act of creation, and problem solving–these are just some of the qualities that can happen in makerspaces and encourage participatory learning. My excitement about the possibilities of makerspaces was fueled today by an unexpected trip to a local Barnes andNoble store and stumbling upon the “School’s Out! 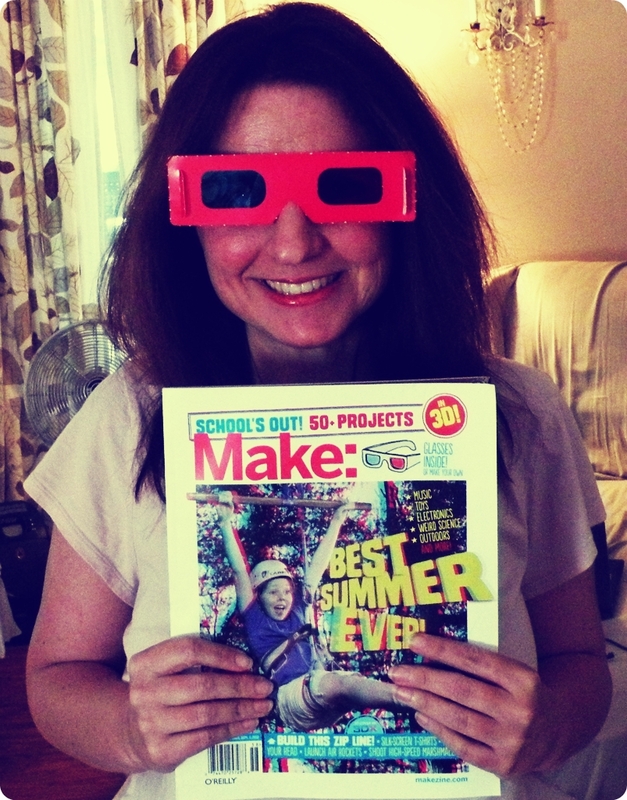 Summer Fun Guide” issue of MAKE magazine which includes a set of 3D glasses to interact with the magazine features! While some of the makerspace ventures do involve some startup costs and others might involve equipment and materials that wouldn’t fit the typical school library budget, this issue is brimming with ideas to help librarians easily craft makerspace culture on a dime. So what are some additional resources if you’re in the initial thinking/planning/wondering stages for how to create a makerspace as an essential learning space in your library? Are you thinking about incorporating makerspaces (as well as hackerspaces) into your library during 2012-2013? If so, please help the education and library communities crowdsource this concept by sharing your resources and ideas! Why no, B&N, MAKE is not just for men or boys–girls like makerspaces, too! 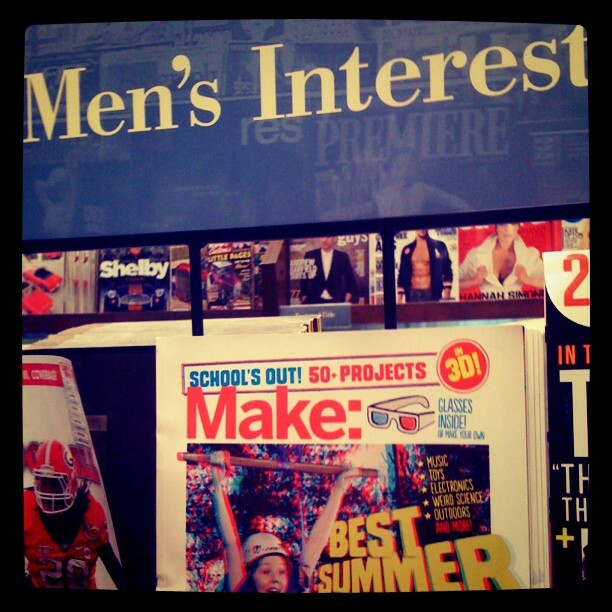 Interestingly enough, the magazine issue was on display in the freestanding “men’s interests” display rack—I did complain to a salesperson that the placement of the magazine was not only sexist but age inappropriate as a magazine geared toward children should probably not be displayed prominently to magazines featuring covers featuring excessive cleavage of women–she promised to share my concerns with the magazine section manager, and I’ll follow up to see what happens. Thanks so much for the shout-out! I had a blast talking about community outreach, the makerspace mindset, & participatory learning @ #ala12. So many libraries are doing great things in terms of sharing community knowledge and inspiring DIY culture. Queens Library might be my favorite at the moment. Erinn, thanks for all the great work you are spotlighting through the project and in your presentations! Are your slides posted online? I’d love to link to them! I’ve been on the same wavelength as you for a couple of months now. Been reading the same posts! We have a room in our library that I think can fulfill a function like this, and I’m trying to work out what I need to do to get something up and running in there that will allow my kids to see more possibilities for creation. Thanks for providing some food for thought here. Jenny, that is fabulous! I cannot wait to see what you and your students do! I’m doing some planning now to see which teachers and students can help us make this happen. Thank you for taking time to read my post, and if you ever need someone to bounce ideas around with, please let me know! Jenny – I, too, have been researching makerspaces for hs libraries and am looking to make it happen esp since I have an alumni class of our school looking to donate money to the library. Wondering if you’ve put this into action and if so what kind of things you’ve purchased. The Unquiet Librarian posted today about the concept of libraries as Makerspaces, a place where people can explore interests, use new tools and materials, and develop creative projects. The Maker movement is a growing trend, with Makerfaires popping up all over the country where all generations can share creative projects and ideas. Are there any readers of our blog that are now involved in Maker or Makerlike creative projects? What are your ideas on how libraries can become a springboard for makers, movers, shakers and creative learners? Creating Innovators by Tony Wagner is another inspiring read. Melanie, thank you for that book suggestion from Tony Wagner! Congrats. on getting Freshly Pressed. I hope that libraries will tap into the talent of some older teens to write up/blog book reviews on young adult books. And let an older teen share library forum/blog moderation duties as a volunteer. It’s a great win-win learning experience for everyone. One of the WordPress forum bloggers complained her local public library wasn’t interested in her book reviews. With tools like Pininterest and Scoop-It group collaboration that taps into meaningful yet fun research and ideas swapping, I can see makerspace taking off like a shootingstar. Best wishes, from a MLS-degreed blogger (but no longer a librarian at this time). Hi Jean! We’ve actually had some of our teens do just those things in the past although it was a little challenging to get volunteers this past year–we’re hoping to recruit a new teen blog team as I agree library blogs should reflect the voices of the patrons! Like you, I hope we can see more libraries adopting a participatory stance and having patrons of all ages taking an active role in content creation through many kinds of mediums. I like the idea of libraries (and not just school libraries) being a place that uses a vast array of options for learning and growth. The old image of just stacks of books just won’t do. I have lived in cities and small towns. I have always loved the library (though I still need to return that book from 3 years ago and plea for amnesty for the third time). I really feel that library budgets should be increased drastically. Libraries hold so much potential and more people would engage if the library could do things like a maker space. It all costs money, yes, but considering some other investments that communities make, I think the library deserves a much much bigger slice of the pie! Last year the library staff at the Collegiate School in Richmond, VA teamed up with one of the middle school tech teachers to create a makerspace in the library. It’s not an ideal space, but it will do for now. We had a Makerbot Thing-o-matic, which really drew attention to the space. Maker Shed and Spark Fun both sell kits and parts for projects. The Make and O’Reilly books are must-haves for any makerspace (or any library really). Makerbot Industries has curriculum and lesson plans on their site. 3D printing is still (I think) an emerging technology. Most people don’t really understand what it’s all about, so the lesson plans/curriculum guides can help explain it all to teachers and admin. I’ve been following Andrew Carle’s blog (tieandjeans.wordpress.com). He guides a middle school maker club and has some insightful things to say. I’m also keeping an eye on the University of Mary Washington’s library. The librarians, along with staff from UMW’s Division of Teaching and Learning, are converting an old classroom into a makerspace. I think it’s scheduled to open in the fall. The Constructing Modern Knowledge conference looks pretty cool too. I’m hoping to go next summer. Maybe I’ll see some of you folks there. If there’s a local maker/hackerspace in your area, visit it. The people who support those organizations are invaluable connections. The spaces sometimes offer cool classes too. I’ve dipped my toes into C programming, e-textiles, and soldering at Hack.RVA, the Richmond hackerspace. If you have the flexibility/freedom/time, get the kids involved. Start a maker club. Kids’ enthusiasm is the best PR and a great way to gain support for a maker program. I’ve been collecting makerspace-related articles and such over at Scoop.it. Here’s the link to my collection: http://www.scoop.it/t/makerspaces/. You’re also welcome to take a look at a Google doc I created. I’m housing random makerspace notes there. Feel free to add to it. Sounds like you are turning the library into summer camp. It sounds like absolute fun. I wish I could have had a creative librarian like you when I was a kid. I strongly believe learning happens in a lot of ways, including “play”! Thank you for those kind words of encouragement! Fascinating concept that is perfect for community building and enhancing. It really is! The more I’m learning about makerspaces, the more excited I am about the possibilities! Thank you for taking time to read my post. Great idea, and congrats on being freshly pressed. I’m a maker and open source technology designer, spent two years bouncing round Europe working principally on a solar energy device, mostly in squats and autonomous centers as they were the only places I could find where I could stay and work for free. It was usually less than ideal, but I got it done. Currently I’m involved in a group called Open Source Ecology Europe, we’re in the process of setting up a network of free and open project and permaculture spaces, starting with on the ground locations currently in Spain, Italy, Poland, Greece and I think Croatia..
Long story short, there is a desperate need for this kind of space that people can just drop into and start working on stuff. Open source software is so successful a model because all people need to collaborate is a computer and the web, but with hardware you really need to be in the same room as the people you’re working with, and have physical access to tools and benchspace. I can tell you from personal experience how frustrating it is have a bunch of things to be working on, but nowhere to do so. We can be building all the solutions to the problems of energy and food production, water, communications, transportation, housing… but these technologies need to be developed, and the people with the initiative to do so are very rarely those with the access to the necessary resources; practical, informational or human. Hi Daniel! Thank you so much for your insightful and passionate reflections! I am committed to making this happen–I am already making contacts with some of my faculty this summer to enlist their help and expertise so that we can have this wonderful learning/mucking around/inquiring/making space in the library for our school community—I’m hopeful that we can utilize this makerspace as both a place for recreational learning but also as a sort of learning lab in the library to support inquiry with classroom teachers and their students. Hi Katie! Thanks so much! I think “fun” is one of the things we’ve lost sight of in many learning spaces–I think makerspaces is a wonderful way to bring that back! Just wanted to say “thanks” for sparking my interest in participatory culture at the Libraries United Conference in May 🙂 There are so many exciting possibilities for the future of libraries. And don’t forget to invite some of your local YA authors. Many of us want to be involved in these creative ventures. For sure! I’m very interested in makerspace culture with publishing and creative expression, too! Thank you for that suggestion! How cool would it be to have a Makespace Camp during the summer at the library? And our own mini MakerFaires? Right now the possibilities are just popping in my mind, and I’m excited to meet with my teachers, students, and admin to explore ways we can create makerspaces in the library and position the library as the ultimate makerspace in our community! That’s a great use of the space for learning. I really hope this concept catches up across many more libraries, it would be lovely to participate – thanks so much for sharing this! Thank you so much for all this great info. I have some unused space in my elementary library that I have been brainstorming about how to best use. My thoughts have been focused on a “creation station” for students and teachers. The information that you have shared has me so excited! I can’t wait to read and research a little more and create a plan of action for my space! I have worked at a school library while it was beginning its transition into developing more interactive spaces and opportunities for students. I appreciate your blog, and look forward to sharing some cool ideas you have here with some of my friends who do library work (love the idea of crowdsourcing – library resources should be shared between institutions)! Awesome ideas for what the library could/ should be! The idea of a library as a makespace sounds amazing. I am extremely interested in seeing how I can incoporate some of the facets into my own school library. I am excited to learn more about this concept and see how I can go about creating my very own makerspace. I think the students would benefit in so many ways. I look forward to reading more about it. Thanks for all the information and websites. Just to defend the placement of Make Magazine for a minute. Usually the magazine is an adult magazine, meaning that it is geared towards adults, not children. I’ve never seen it in the Men’s section at my book store, but usually in the DIY section. It may be a sexist placement, but most projects in there are geared for adults. Hello, Just came across this blog tonight. So excited to see it! I am currently writing my thesis on the museums and the Maker Movement and was feeling distraught over how little I could find on the learning side of things. I believe some of your links will be helpful. Thank you again! I am afraid my kids can’t do this. And when they need to be reading more, the literacy rate is much too low in my district, I don’t know if I want to deviate from reading to delve into Makerspace. It confounds me when librarians, who have never tried makerspaces, dismiss them because they need to do all reading all the time. Do you tell your principal that when its time for you to go test kids in the library instead of have kids reading? What about when you are teaching research skills? That’s not purely literacy/reading. Reading & MakerSpaces are not mutually exclusive! I have a super small library so I don’t have the space to have a permanent space, but we do a once a month lunch time MakerSpace and the students are engaged, joyful, creative, productive, problem solving, following directions, and more. Until recently I have had an ‘old-school’ administrator who was a bit of a luddite. My new assistant principal is very forward thinking and is working with me on project based learning over the summer and for next year. I plan to integrate more makerspace ideas into my curriculum. This is the first time she has heard of the concept but she is open to trying anything to increase student interaction, community support, and literacy in our school. I am very excited! how do they function? Who cleans up the mess when students are done “Being Creative”? and what kind of huge messes they leave in the art department. Sandy, I guess I’m not sure I understand why your library would be managing the makerspace if it is hosted elsewhere outside the library? Whoever is faciliating the makerspace—and sometimes it is a partnership of different groups or departments—would be responsible for answering the questions you pose. There is no pat or formulaic answer because every makerspace is different and should be based on the needs of its learning community.